Plagiarist. You had the chance to cite Keaton in your sound source, and again when herogreenx ASKED YOU THE SONG YOU USED. But you want all the credit for yourself, don't you? Plagiarist. Um, Rafe, I found the song from a link on youtube ( http://www.savefile.com/files/1074859 ) and I just searched "Cosby," and took what came up. I suppose I could credit more specifically, but honestly, I don't think anyone making a mediocre site like this cares that much. You can still edit your sources. Please, give credit where it's due. It's worth it. Well there you are, Rafe. Nicely done! Can you make it into a gif with him bopping his head to the beat? Thanks! I guess I could, but Photoshop and imageready are on my other computer, and I'm lazy right now. Well, I'll keep my eyes peeled. should have used more of the family guy clip and made it wackier. All in all, decent effort. Thanks! 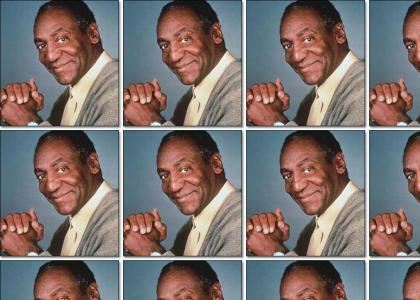 I thought that I didn't have enough of all the Cosby clips, but the song was a bit short. Well, it's a fad. What did you expect?